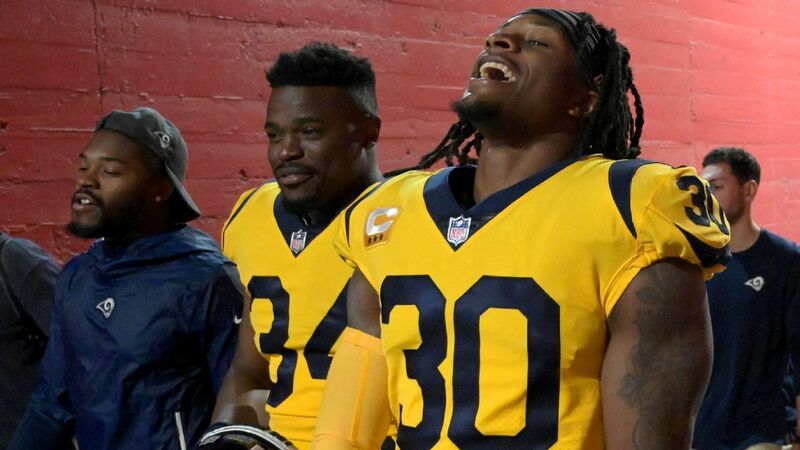 American football running back Malcolm Brown made his entry into professional football with the Los Angeles Rams of the National Football League. Brown joined the team in 2015 as an undrafted free agent and has shown great tenacity and strength over the years. Malcolm’s love for football started at a very young age when he was in high school, and he has stayed true to his dreams. Seeing how good he plays, it will be a lot rewarding to find out the details of this players background and we have got all that here. He was born on May 15, 1993, in Biloxi Mississippi. Malcolm Brown is an alumnus of Byron P. Steele High School in Texas. Joining his school team as a junior he rushed for 2,192 yards and clinched 24 touchdowns. His senior year was even better as he had 30 touchdowns and rushed for 2,596 yards taking the team to the Class 5A Division II state championship for the very first time. One of his many achievements in high school was playing in the US Army All-American Bowl. Malcolm Brown was also remarkable in other sports like basketball and track and field. For his distinctive exploits throughout his school years, he was listed as the No 1 running back prospect in 2011. Towards the end of his high school, he got offers from different universities including the University of Texas, Florida State, Alabama, Oklahoma, Notre Dame, and Stanford. Malcolm took the offer of Univesity of Texas and enrolled in 2011. Brown debuted in the 2011 season with the Texas Longhorns team in the third quarter of a game against the Rice Owls of Rice University, Houston Texas. Despite a painful foot injury, he succeeded in finishing the season with a leading 742 yards on 172 carries and 5 touchdowns. He got better and better in every season; his 2012 season ended with 324 rushing yards, 15 receptions, four rushing touchdowns and one receiving touchdown. The talented footballer made his best records in his 2013 season with the Texas Longhorns. In every of his team’s games, he played impressively which led to their victory in most cases. At the end of the season, he recorded 904 rushing yards, two receiving touchdowns, nine rushing touchdowns, 17 reception and 195 receiving yards, the best he ever had with the team. He ended his college career after the 2014 season which he finished with 708 rushing yards, 16 receptions, 6 rushing touchdowns, and 58 receiving yards. Malcolm Brown was an undrafted free agent when he was signed with the Los Angeles Rams in May 2015. In September that same year, he was moved to the practice squad and then got promoted to the 53-man roster. The talented player made his NFL debut in January 2016 at the game against San Francisco 49ers where he recorded four carries for 17 yards. In the 2017 season, he was the number two running back; he made his first career touchdown at the fourth quarter of the season. At the end of the 2017 season, Malcolm Brown recorded 246 rushing yards, nine receptions, one rushing touchdown, and 53 receiving yards. The 2018 season saw him play as a primary backup to Todd Gurley. He played 12 games and sustained an injury in the thirteenth week. But in all 12 games, he recorded 212 rushing yards and five receptions for 52 yards. Malcolm Brown’s stay with the Los Angeles Rams has contributed greatly to his financial status. On joining the team, the running back signed a contract worth $1,583,500, expected to last for three years. For this contract, he received $8,500 as a signing bonus. The Rams player has his net worth estimated at $1.76 million. For the year 2017, Malcolm earned up to $540,000. The running back was born to his parents; LaShune Brown his mother, and Tommy Brown, his father. Not much is known about his parents but it is said that they were very supportive of their son’s interest in football from his young age and still are. Malcolm Brown has got the right body that fits his daunting career. He stands at a height of 5ft 11in (1.80m) which is quite proportional to his weight of 222lbs or 101kg. Brown’s body structure is a plus to the player. His broad shoulders and strong arms make it easier for him to receive handoffs and catch passes from out of the backfield.